Every two weeks, Big Issues focuses on a newly released comic book of significance. 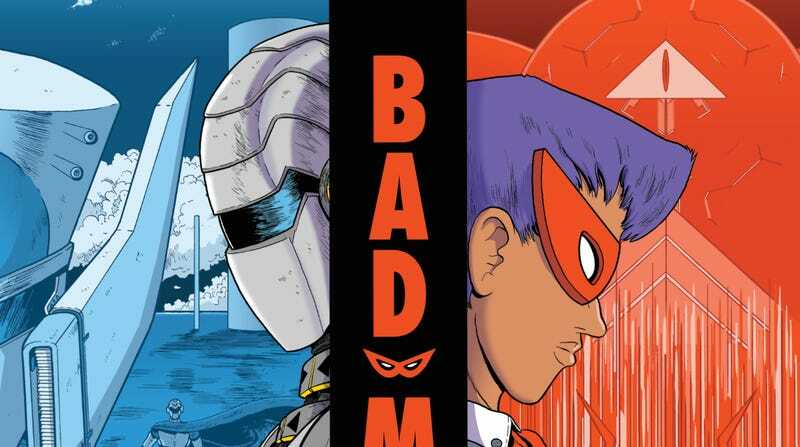 This week, it’s Bad Mask, a comic book box set by Jon Chad (Science Comics, BOOM! Box Mixtape) that shows off the cartoonist’s versatility with an expansive multimedia superhero story. In 2012, Pantheon released Chris Ware’s Building Stories, a boxed set containing a variety of periodicals and broadsheets that combined to create a sprawling yet deeply intimate narrative about a building and its tenants over the years. It was incredibly ambitious, showcasing the myriad creative possibilities in bringing together words and pictures while highlighting how different formats change the reading experience. It’s easy to see why publishers haven’t tried to replicate a project like Building Stories given how intensive the production process is, but BOOM! Box is tapping into the spirit of Ware’s work with Bad Mask, a boxed set with a more kid-friendly angle. Written and illustrated by Jon Chad, with production design by Jillian Crab, Bad Mask is a serious undertaking, delving deep into a superhero world through seven different printed pieces: a comic book single issue, a set of trading cards, an organizational handbook, a meeting transcript, a newspaper, a magazine, and an incident report. At the core of the story is the conflict between mechanical hero Metal Metro and the titular terrorist organization, but as the reader learns more about these dueling forces, these various documents and objects reveal a deeper conspiracy. Unlike Building Stories, Bad Mask has a suggested reading order laid out, in a memo sent to Brasso Mask, a member of the supervillain group who uncovers the dark truth about the relationship between Metal Metro and her organization. The single issue of The Real Adventures Of Metal Metro is to be read first, showing the most fantastical, sanitized version of the hero/villain dynamic. The comic has a retro superhero vibe, with lots of puns and silly plot elements, like a cotton candy gun and deadly robots disguised as food, and readers are given an easy gateway into this world with a simplified, light-hearted tale that shows how Metal Metro has managed his public image and embedded himself in popular culture. This idea is reinforced by the comic’s ads for a Metal Metro-inspired soup and soda, a film starring the hero’s submarine ally, and a Metal Metro video game, all of which allow Chad to show his knowledge of commercial illustration. The breadth of Chad’s talent is the most impressive thing about Bad Mask, as he changes his voice and visual sensibility for each medium. Every new piece of media expands the world of the story in its own way: The trading cards provide new details about Metro Man, his equipment, his allies, and major events in his history. The handbook starts to shift the focus to Bad Mask, fleshing out the organization’s structure and its guiding philosophy. The transcript takes the reader into a key Bad Mask meeting, giving its members distinct personalities before taking a tour of the base with a comic. With the newspaper, the scope of the story dramatically widens. The pages are filled with articles, reviews, horoscopes, games, and a variety of comics. There are the comic strips you’d expect to find, but a large chunk of the newspaper consists of a photojournalism piece that is an account of Bad Mask’s latest mission composed of sequential images from various sources. This is the most visually striking work of the entire project, and without any dialogue, Chad has to convey all of the emotion in the artwork. There are descriptions for each image running along the bottom of the page that contextualize each moment, but they offer a journalistic, impersonal view of what happened. This piece turns out to be a fascinating examination of how visuals can intensify text and imbue it with feeling. Chad continues to offer a macro perspective with the magazine, in which he looks at the history of Black Mask while exploring how business, pop culture, science, and technology change in a superhero world. Visually, it’s an opportunity to flex his editorial illustration muscles and explore a more mature aesthetic than the superhero comic. The final physical object is the incident report, a folder containing a comic that drops some major bombshells and confirms suspicions that have been developing over the course of the story. Each of these items needs to have its own look and feel, and production designer Jillian Crab does exceptional work finding the right paper stock and binding to create a sense of authenticity. That design specificity ultimately has an effect on the storytelling. Holding a glossy stapled comic book is not the same sensation as holding a file folder filled with loose-leaf sheets of printer paper. The former is packaged for mass distribution, and its content has to go through multiple levels of approval before ending up in the reader’s hands. There’s a sense of rawness and urgency with the file folder; it needs to get to its destination so quickly that there isn’t even time to staple the pages. Using loose-leaf paper might not be the neatest way to present the story, but it changes how the reader engages with the document. There’s also a digital component to Bad Mask: a password-protected website where readers can unlock new content like photos of the main character’s journal, her webcomic, archived emails and letters, a video, and most importantly, the final chapter of the story. It’s a smart way to continue exploring the multimedia concept without needing to print more materials, but having the conclusion be a digital file is a mistake. Bad Mask is all about how the media formats inform storytelling, and reading the finale on a screen diminishes its impact. With its huge stakes and epic scale, the last chapter deserves the most lavish printing of all, like a thin hardcover or a glue-bound, cardstock-cover one-shot in the vein of DC Comics’ Prestige Format. Ending the story with the digital content forces the reader to engage with the project’s online element; there should really be a complete narrative inside the box. Bad Mask isn’t as sophisticated or refined as Building Stories, and that’s totally fine. They’re for two completely different audiences, created by two cartoonists with contrasting points of view, working on opposite ends of the genre spectrum. The target audience for Bad Mask is much younger than Building Stories, and if Chad gets too advanced, he risks making the book inaccessible to children. Much of Bad Mask can be read by kids who can handle a chapter book, but there are parts that will definitely pose a challenge. The more mature storytelling elements make this work engaging for adults, but they also provide material that younger readers can engage with on deeper levels as they get older. They may not understand magazine essays about Metal Metro’s gender identity and the predatory “Metro Management” investment strategy right now, but that might change in a few years. Bad Mask has long-lasting entertainment and educational value, and it’s an excellent gift idea for kids who have a passion for books, exposing them to a multitude of storytelling formats as it delivers an interactive superhero story full of action, drama, and humor. The simple act of opening the box makes this more exciting than the typical superhero comic. Chad has created a piece of multimedia art full of wonderful surprises.